Add in the chopped mushrooms and onion and saute until tender. Add in the garlic powder. Briskly whisk in the flour until a thick dough forms. Cook for about 1 minute. Very slowly add in the milk whisking constantly until thickened. Reduce the heat to low and allow to simmer and thicken. Remove from heat and stir in the sour cream. Spray a large slow cooker (I used a 6-quart crockpot) with nonstick spray. Pour in the creamy base. 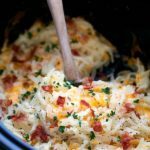 Top with the whole package of hashbrowns and the shredded cheddar cheese (I like to use freshly shredded as the packaged tends to get a bit greasy). If you like an extra cheesy casserole use a full cup, otherwise use just 3/4 a cup. Add salt and pepper and stir everything together. Cover and cook on high for 2-3 hours. Remove the lid and allow to cook another 30 minutes to an hour to get crispier on top. Just watch these times carefully depending your slow cooker -- if you have a really hot one it may be done sooner and a cooler one will take longer. Each crockpot is so different! Top with toppings of your choice such as cooked and chopped bacon, chopped parsley, additional seasonings, etc.